Gabrielle Union’s engagement ring from Dwayne Wade features an 8.5 carat cushion cut diamond. According to The TMZ, Dwayne underwent a painstaking search for just the right stone, with his jeweler, Jason of Beverly Hills, making three separate trips to Miami. Luckily for Gabrielle and Dwayne, the third time was the charm! Like Gabrielle Union’s engagement ring, this custom diamond ring from Brilliance features a gorgeous cushion cut center stone. Because massive rocks like the solitaire Gabrielle wears can be so difficult to find – not to mention costing more than the average budget will allow – we added a halo to this one, providing the illusion of a much larger stone. 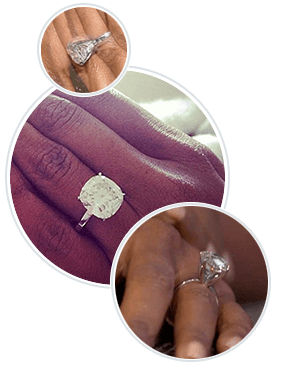 The accent diamonds on the band provide additional sparkle and elegance for a look that gives a nod to Gabrielle Union while taking advantage of the availability and lower cost of a center stone that’s much more attainable. Born October 29, 1972, Gabrielle Union is an American actress, and was formerly a model. She has taken on a number of notable roles over the years, playing a cheerleader opposite Kirsten Dunst in Bring it On and starring with Martin Lawrence and Will Smith in the hit movie Bad Boys II. She played a doctor in the popular CBS series City of Angels. Gabrielle was born in Omaha Nebraska, and is the daughter of a social worker and phone company manager, Theresa, and a military sergeant and business executive, Sylvester. She says that she was raised not just as a Catholic, but as “an independent woman, standing on my own two feet.” Her earliest memory is a sweet one – that of playing catch with her dad. She attended the University of Nebraska, playing on the soccer team before transferring to Cuesta college and eventually transferring to UCLA, where she earned her degree in sociology. While in her senior year, she interned at Judith Fontaine Modeling and Talent Agency to earn extra credits toward her degree. It was there that clients noticed her and expressed disappointment that she was not a model. As a result, she was invited to begin working as a model, which she did until her agent noticed her talent for acting. Her first roles were minor ones, but her performance in Bring it On led to bigger and better things. Gabrielle won an award for Best Actress at the palm Beach International Film Festival for her starring role in Neo Ned, and in 2010, she was nominated for an NAACP Image Award for Outstanding Supporting Actress in a Drama Series for her role as Zoey Andata in the ABC series Flash Forward. Did you know that Gabrielle Union has her own clothing line as well as her own wine label? In 2010, she launched her clothing company, Love & Blessings, which features clothing designed for full figured women. In March, 2014, she released her first wine, which is called ‘Vanilla Puddin’. Gabrielle Union and Dwayne Wade have been a hot item since 2009, when they first began dating. Although they broke up due to career demands for a short time in 2013, the separation was tough on them. Gabrielle and Dwayne reunited in December, 2013, and were married on August 30, 2014, in Miami. What Our Experts Have to Say about Gabrielle Union’s Engagement Ring. While almost all celebrity engagement rings are incredible, the one Gabrielle Union received from Dwayne Wade is a rarity even for Hollywood. The cushion cut diamond at its heart is absolute perfection – and at 8.5 carats, it is truly enormous. The cost of the diamond alone is estimated to be one million dollars, although the engagement ring’s price has not been confirmed. If a million dollar diamond is out of your league, take a look at the cushion cut loose diamonds for sale at Brilliance. Enjoy a solitaire setting like the one featured on Gabrielle Union’s engagement ring, or enjoy a little extra sparkle with a halo, side stones, or both. Try out the fun, easy online tools and create a custom look that’s all your own while giving a nod to Gabrielle’s design. The diamond experts at Brilliance are happy to help you create the perfect engagement ring: One that suits your style while accommodating your budget. Love doesn’t have to be expensive, and with Brilliance, affordability is more beautiful than ever.